I was sent bottles of 2 different types of deodorants from Naturally Fresh to try out and give a review. One of the deodorants is a spray and the other is a roll on. They are both hypoallergenic, paraben/PG free , Fragrance Free and neither has Aluminum Chlorohydrate in it. Most people who are looking for natural deodorants are doing so because there is Aluminum Chlorohydrate in regular drug store brands. Aluminum Chlorohydrate has been linked to breast cancer and alzheimers. It is also used as a coagulant in water purification. The European Journal of Cancer Prevention reported that shaving and using regular antiperspirant/deodorants has been linked to tumors and breast cancer. I tried out both deodorants from Naturally Fresh and they both work well. I prefer the roll on though. It didn’t leave any stickiness that I have experienced with some other natural brands. 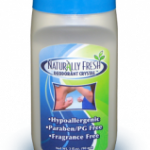 Naturally fresh deodorants contain mineral salts that form a protective barrier against odor causing bacteria. They don’t have any chemicals, propellants, perfumes or preservatives. These deodorants can also be used on your feet to protect from odor. If you are looking for a natural alternative to antiperspirants this is a brand to consider. Winter is a perfect time to switch to a natural brand considering we don’t sweat as much in the winter than the summer and it gives your body time to adjust. This is also a great brand to give to a teenager who is just starting to use deodorant being it’s completely natural. You can get naturally fresh at GNC, Kroger,whole foods, walmart,Amazon.com and many more stores.